REWIND The band was founded in november 1996 after multi-discipline artist Rudy Trouvé met with singer Daan Stuyven at a party, recording their first demo "Chemical" a week after, and playing live a month later, joined by Elko Blijweert on guitar and Herman Houbrechts on drums. The typical band sound consisted of Rudy's experimental guitars, combined with Elko's virtuoso guitar and Daan's deep voice and more melodic guitar. No bass. A combination of unorthodox cut-up home recordings blended with Spector-like mixes and lyrical surrealism. 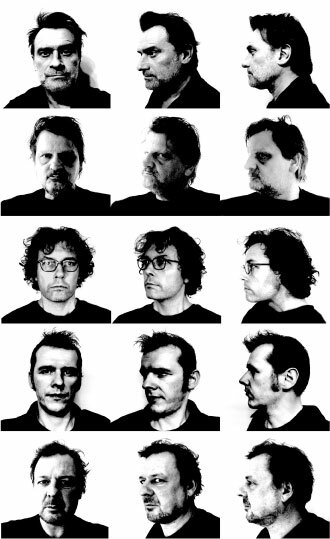 The first album, "Berchem" joined by producer Wouter Van Belle on keyboards, enjoyed immediate critical succes, and in the years that followed they toured through france, switserland, england, holland and germany. some fine moments included a BBC John Peel session, a Rockpalast TV show, a trashy funny main stage act at the Dour festival during the world cup final in '98, and an endless string of club shows, which gave the band it's exquisite live reputation. Drummer Karel De Backer joined the band for the second album "Trap", based partly on a musical remake of a 1962 cult movie featuring country legend Bobbejaan Schoepen. A short EP, "Marginal" including 27 tracks followed a month later. Their third album "Cago" was recorded with audio hero Steve Albini in his Chicago studios in the winter of 2002. The first single enjoyed a videoclip by dutch animation artist Han Hoogerbrugge, and remixes by a.o. Colin Newman. PAUSE And then they needed a break. The break took 16 years. But these years were very fertile for all the band members, resulting in many collaborations and side projects, theatre and soundtrack writing, record productions, and a succesfull solo career for Daan.